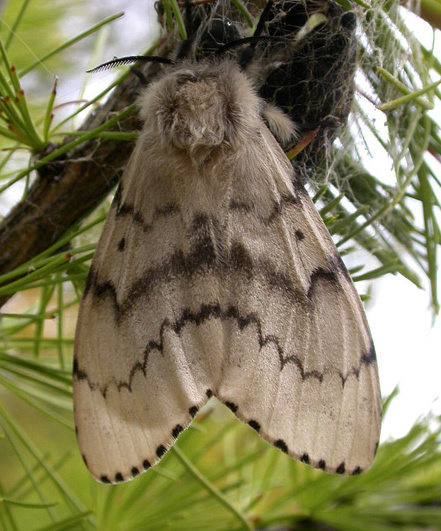 What is the Gypsy Moth Life Cycle? WORRIED YOU MAY HAVE A GYPSY MOTH PROBLEM? 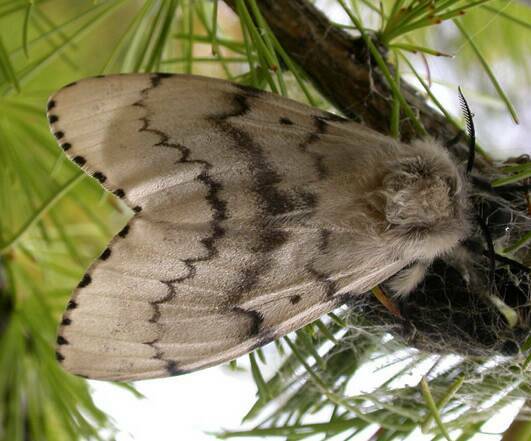 The gypsy moth, Lymantria dispar, is not a native to the US but was introduced in the 1860's from Europe in the hope of developing a hybrid silk worm. 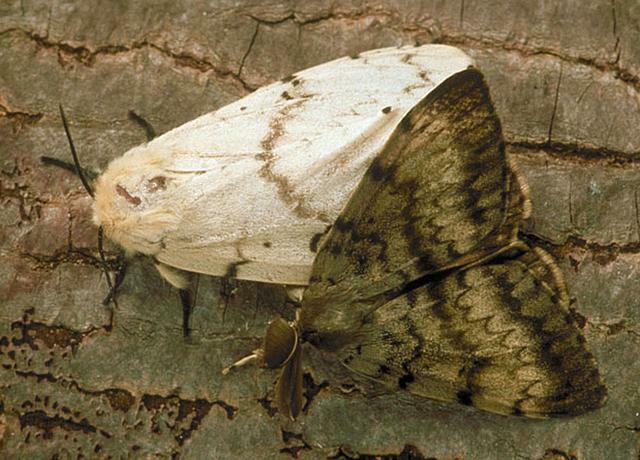 When some of these moths escaped they found the US a suitable habitat and have been expanding their infestation ever since. 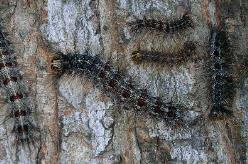 The gypsy moth is now one of the most notorious pests of hardwood trees in the eastern half of the US. How do I know if I have a Gypsy Moth problem? 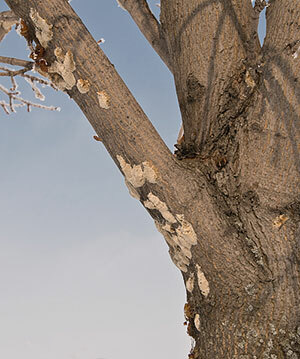 Look for tan or buff-colored masses underneath the branches of trees, on the side of houses or on outdoor objects like sheds, rocks and swing sets. These masses house between 500 - 1,000 gypsy moth eggs. These eggs hatch into caterpillars in April. HSS has a qualified gypsy moth program coordinator with 11 years experience surveying gypsy moth for county & state programs. The survey is free of charge and will let you know if your infestation is severe enough to require aerial treatment. What do Gypsy Moth eat? 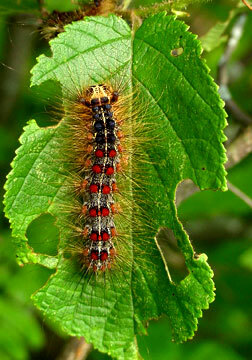 Gypsy moth prefer oak trees but they will accommidate their tastes to almost all foliage including evergreens and schrubs. Gypsy moth caterpillars are easy to identify, they have 5 pairs of blue dots followed by six pairs of red dots lining their back. In addition they are dark colored and covered with hairs. Why do I need to treat? 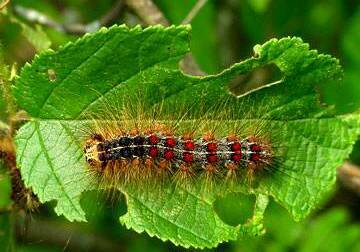 When a gypsy moth caterpillar emerges from its egg mass it has a voracious appetite and will eat all green vegetation in sight! 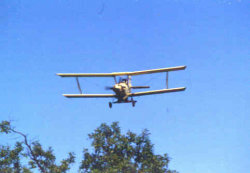 The best way to treat heavily wooded areas that have been infested with gypsy moth is by applying Bt pesticide with agricultural aircraft during the caterpillar stage of the gypsy moth. Bt is a naturally occurring strain of Bacillus Thuringiensis spore. Bt is highly specific to gypsy moth caterplillar. The Bt must be ingested by the caterpillar to be effective. How do I make sure my property is included in the Gypsy Moth Program? We will make sure to help you get organized so your property can be treated if it is needed. 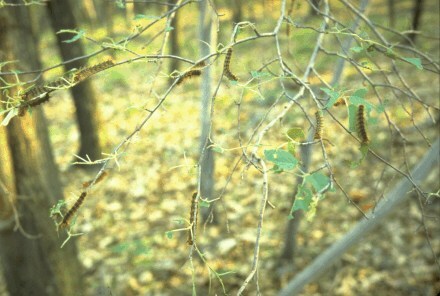 Treatment for gypsy moth is very dependant on the weather and development stages of the caterpillar but historically treatment starts in mid to late May. 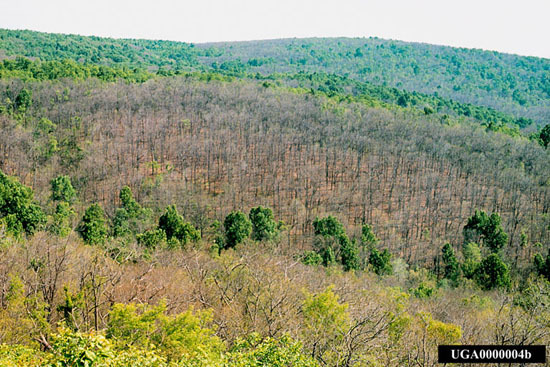 Aerial treatment does require a minimum amount of acres to be effective. If your property does not meet the minimum amount of acres needed we can group neighbors and/or subdivisions together to provide you with cost effective treatment options. Please contact the office 616-837-6979 for a quote. Because of the nature of Bt you will not notice an immediate kill of caterpillars. 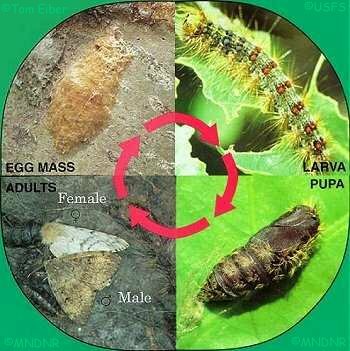 First the caterpillars must consume the leaf with the Bt on it and after time the caterpillars will die. You will also not see a complete kill. What the Bt does is reduce the number of gypsy moth so that the damage is less and the population stays in a manageable number. What is the best way to treat my gypsy moth problem? Is there anything I can do on my own to help control the population?